India is been known as an agrarian country for years as almost 60 percent of the population of India is dependent on agriculture for living. The government of India has over the years taken various steps to boost agriculture and its exports. India exports numerous food/ agricultural products worldwide. Food products can be divided into primary food crops, cash crops and secondary food crops. Primary food crops include vegetables, cereals, spices, meat, oil, fruits etc. India’s foreign trade i.e. imports and exports are been regulated by that of the Foreign Trade policy that is been noticed by Central Government. 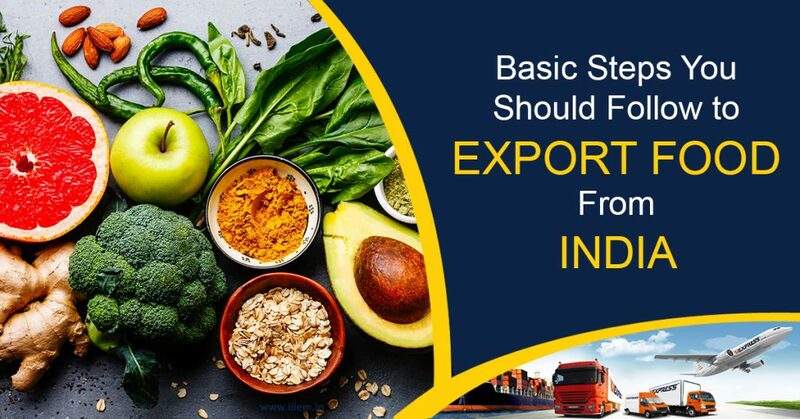 Inorder to start the business of export, a sole Proprietary concern/ Company or a Partnership firm needs to be set up as per prescribed procedure with some attractive name and logo. Current account needs to be opened with a Bank that is been authorized to deal in Foreign Exchange. It is a compulsory document, which needs to be obtained by every importer and exporter. This certificate is been needed for availing export/ import authorization or benefit or concession under FTP 2015-20. Expect the products that appear under restricted or prohibited list, all are freely exportable. One needs to select the product after detailed research. An overseas market should be selected after research covering market size, competition, quality requirements, payment terms etc. Indian Missions abroad, Export promotion agencies, friends, relatives and colleagues might be helpful in gathering the information. B2B portals, buyer seller meets, web browsing, participation in trade fairs and exhibitions can be considered as an important tool to find the buyers. Creation of multilingual Website with that of product catalogue, payment terms, price and other related information can be of great help. Providing customized sample as per the need of the Foreign buyer would help in getting orders. Pricing of the product is very much crucial in getting the attention of the buyer along with promoting sales. The price should be worked out keeping into mind all expenses from sampling to realization of export proceeds on the basis of terms of sale i.e. Cost, Cost & Freight (C&F), Free on Board (FOB), Insurance & Freight (CIF) etc. After determining the buyer’s interest in the product discussion related to the allowance, discount and other aspects can be considered. International trade involves risks related to payment due to buyer/ Country insolvency. These risks need to be covered by an appropriate Policy by Export Credit Guarantee Corporation Ltd (ECGC).